Today we are excited to post an interview with Casper Grathwohl, Oxford’s Reference Publisher, in which he answers some frequently asked questions. Hopefully his answers with give you a glimpse inside the reference publishing world. 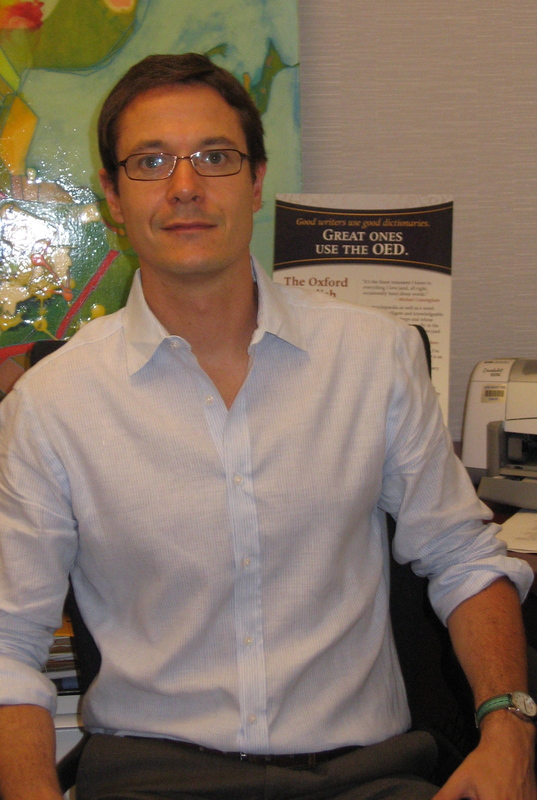 Casper Grathwohl is Vice President and Publisher of Reference at Oxford University Press. In his 10 years at the press, Casper has helped transform Oxford’s print dictionary and reference list into one of the leading online academic publishing programs in the world. Electronic initiatives within the Oxford program have included moving trusted copyrights online (Grove Dictionaries of Music and Art, Oxford Dictionary of National Biography, Oxford Reference Online, and The Oxford English Dictionary) as well as building innovative new research tools such as Oxford Language Dictionaries Online and Oxford Islamic Studies Online. Prior to OUP, Casper worked for both Princeton University Press and Columbia University Press. He currently splits his time between New York and Oxford in England managing the two reference centers of the press. 1. What online resources do you daily and weekly? I’m a big New York Times online fan. I made the switch from print to online a few years ago for my weekday news and it was a surprisingly easy transition. It’s funny—all these habitual activities we feel define us on a daily level (like reading the paper in the morning with a cup of coffee) are much more mutable than we think. I still like a lazy hour or two with the print paper on the weekends, but I can’t imagine reading an article that interests me and not being instantly able to surf for more on the topic, or follow the editorially-driven links provided. Over the last couple of months I’ve really gotten into Street Easy. I’m in the process of buying an apartment in NY and one of my friends recommended I use it for information on comparable purchases in the building, sales history of the apartment and other stats. Most of the real estate listings in the city feed into the site, so it’s the one-stop shop that makes this kind of searching so much easier. And its functionality is highly intuitive—I’ve learned a lot about how to set up a really satisfying landing page from them. I love how online commerce has been such a shot in the arm to these types of mom-and-pop shops. As others have noted, the small independent stores that thrive are the ones that have a niche. They have a value proposition that we don’t associate (and will never want to) with big chains. Local peach butter from a Georgia farm? I’d take that over a new Parket margarine flavor any day! That’s their competitive edge, and with online commerce models anyone can find them. It’s this globalization of the local that I find so interesting. As I said, I’m not pointing out anything new here, I’m just having a great time watching it all happen. What is your favorite reference work? Such a hard question! I live knee-deep in the world of reference so it’s difficult to see it with any real perspective. I’m a big fan of reference-based online experiments, like the Encyclopedia of Life and the Stanford Encyclopedia of Philosophy, (which has proved to be a very successful, although not easily duplicated, experiment.) It’s sites like these that are the signposts to where scholarly communication is heading, and I find the energy these sites create really invigorating. What do you think of Wikipedia? I get this question a lot, and I think wikipedia is great. And I’m a little disappointed by all the complaints about how unreliable it is as a source. Of course it’s unreliable—quick, cheap information has never been anything but! In my circles I feel like there’s this myth that before user-generated web content everyone slavishly referred to trusted reference authorities for their quick information. If only. What did you do if you needed a quick answer to something in the pre-wikipedia dark ages? Nine out of ten times you’d call a friend or ask a colleague before pulling Britannica off your shelf. Was that more reliable? Absolutely not. But that’s OK, because you’d know not to cite one of your friends in the bibliography of your research paper. I think if we start thinking of wikipedia as the equivalent of calling up one of your smart friends and getting a “good enough” answer (which is often all you’re looking for) then we’re on the road to responsibly understanding the awesome power of such user-generated resources. As the web matures, it has come to reflect an image as complex and rich as culture itself. And therefore it should not surprise anyone that multiple layers of authority on the web are not just necessary, they are inevitable and already expanding. Wikipedia, Citizendium, Britannica, and Oxford Scholarship Online all complement each other as distinct, valuable places along the web knowledge chain. And speaking of that web knowledge chain (not to go on a rant here)—we need to start making the distinction between information and knowledge. I would define knowledge most simply as “information in context.” Information is just a byte of something with a fact label attached. But what does that information mean? That’s knowledge. For example, a 13-year-old obsessed with baseball statistics is a fine source for number of RBI’s or home runs Jackie Robinson had. Considering some of the boys I knew growing up, there might not be a more trusted source of such information. But you wouldn’t go to that 13-year-old and ask them to tell you about the significance of Jackie Robinson to the civil rights movement. That would be silly. Yet that’s what we do too often on the internet. Like most people I just fell into it. I liked books and was naïve enough to think that it qualified me for a job in publishing. I started out in publishing at the bookstore end of things: I worked in the buying office at Rizzoli in New York. I remember getting fed up because I was earning $16,000 a year (everyone my age trying to make it in NY was in the same boat, but I somehow failed to notice that) so I quit without another job. Bumming around New York for a summer after that was fun, but I was getting really tired of living on slices of pizza so I moved to Princeton to work as a typesetter at Princeton University Press. After a few years I became an editor and then moved back to New York to take a job editing the Columbia Gazetteer of the World. I love geography and had a great time with it. When that ended (I think it was 1997) I came to Oxford to work in the Children’s and Young Adult group and I’ve been here ever since. And I’ve got to say that I love OUP—the institution, the mission to disseminate knowledge, reinventing scholarly publishing online, all of it. And getting to be the keeper of the great Victorian publishing projects like the Oxford English Dictionary, Grove Music, and the Oxford Dictionary of National Biography is a privilege that regularly humbles me when I think about. How often do you get say something as lucky as that?